Trying to get back in the groove here. What week is this again? We have been extremely busy these last few months so we haven't had much interesting conversation involving the children asking questions or the like. Or the little we had, I hadn't the energy to write it up. So I begin again. Tentatively. Sick. We have been sick and sick and sick some more. It was the girls' last day of Christmas break. I asked Olivia if she was ready to go back to school. She said yes and no. I asked her what she was most looking forward to at school and she said lunch. I asked why she was looking forward to lunch and she said because the day was almost done at lunchtime. Something tells me Olivia is not looking forward to being back at school, but she doesn't hate it either. She is an introvert and I think all the ruckus of school unnerves her. At supper we talked about Brioche. What is it and what makes it that way? Brioche is bread that has butter kneaded into it after a first rise. I had just learned this little bit of information from GeekLady and then by happy coincidence we had brioche rolls for hamburger buns at supper. So we talked bread and King Cake and made plans to try to have one soon. Olivia explained the difference between an ostrich and an emu to us. Ostriches are larger, weigh more, and run faster. This was the only thing I could pry out of either girl about school today. We spent most of dinner discussing the word 'quorum' and how you can't change the definition of the word just because. After listening to me rant on it awhile, Grace finally says, "I don't really know what quorum means because I have never heard the word before today, but I believe what you say is right, Mommy, because I trust your judgement." Think I should have a T-shirt made? Grace came home with a packet of papers from December that needed reviewed and signed. 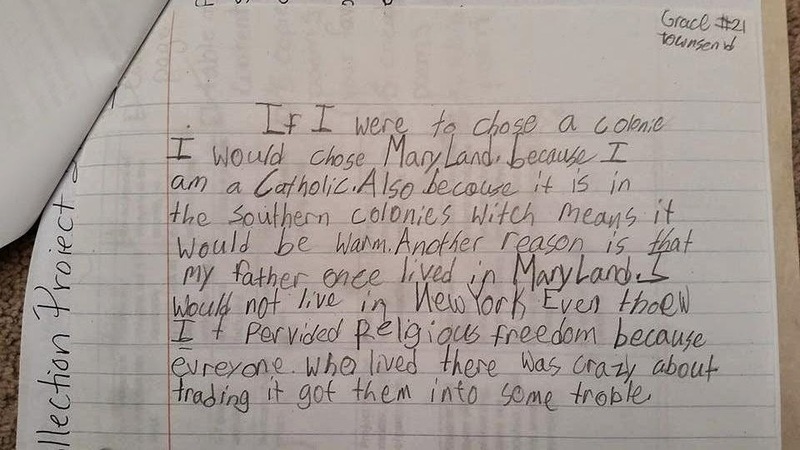 I flipped through them and found a report she wrote on which of the 13 original colonies she would like to live. She choose Maryland because she is Catholic. Interesting because she never mentioned they were talking about religious freedom in class at the time she wrote it. I thought the bit about New York was funny. The girls were off from school due to the bitter cold weather--it was 3F--because of concerns about the buses not running. Dave already had a busy day planned for himself so they all were brought to Grandma's for the day. 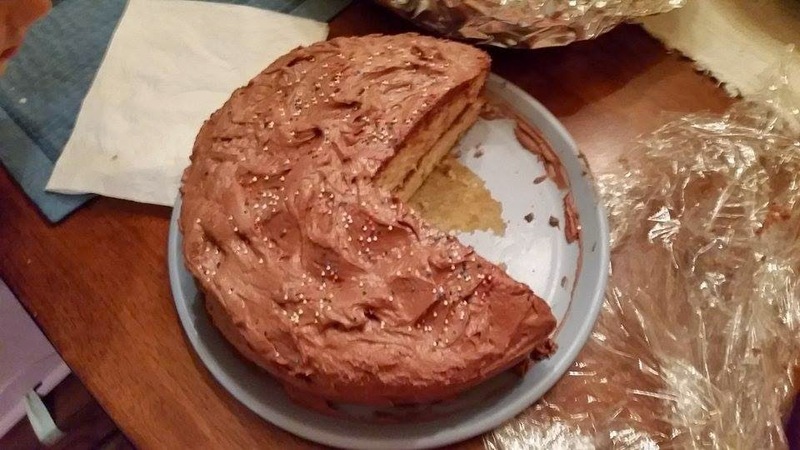 They lobbied Grandma to make King Cake. 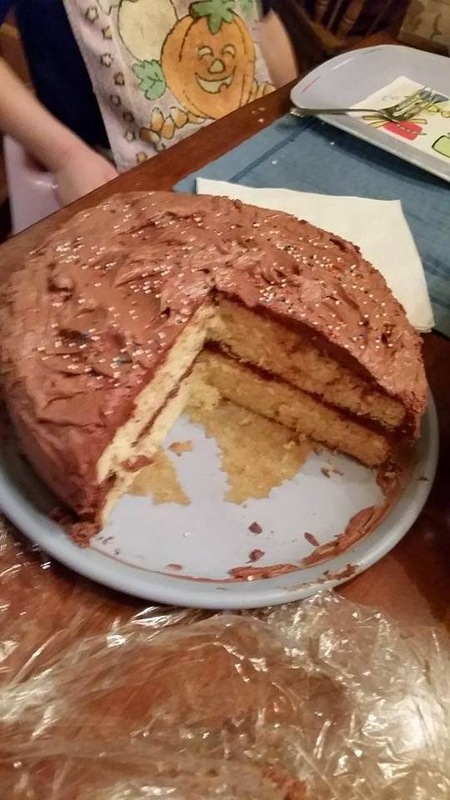 She declined citing no receipe, but they did make a layer cake from scratch with chocolate icing. Grandma is pretty invested in teaching the girls how to cook. I suspect it is born of her truly enjoying cooking and wanting to share her skills and also ensuring that they not turn out like their mother. Grandma cut out a portion for her to enjoy and then sent the rest home for us. At supper we decided to find out the history of King Cake so Dave read to us about it while the children sat entranced. No, actually they didn't pay much attention after hearing it mostly came from France, but I was interested. I also had a random thought while looking at one of Olivia's papers. She had a piece of notebook paper where she had written a list of a few words and her teacher noted that she needed more words listed. She was supposed to list ten r-controlled words, that is words whose vowels are controlled by r like horse or car. My thought was 'What purpose does this serve?' Why do young children need to spend time learning about r-controlled words? I mean not that they don't need to know about the words or even how to spell them, but why to they need to know they are r-controlled. And I started thinking about a lot of the early elementary work. They spend a lot of time learning about all the different categories of words, word families, blend families, and I wonder if this emphasis on categorizing has any value at all. Not that they shouldn't be exposed to the words, but do they really need the gritty details. I don't really think so. I've decided this is make-work for six year olds to justify their time in school. What do yall think? I don't remember much from Friday, but I did sit with Sam and read to him out of Winnie-the-Pooh which was delightful. Grace wanted me to make French toast with her for breakfast, but the prospect of managing that task in the 4'' x 8'' space available countertop was too much for me to bear so I declined. Dave and Grace and Olivia all made French toast for us which seems pretty educational to me. We spent the rest of the day shopping for eyeglasses for two girls.